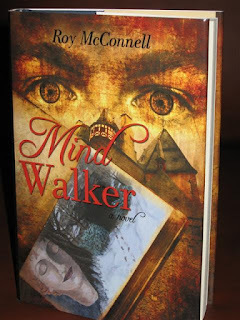 Roy McConnell sent me a copy of his first novel, Mind Walker, and I feel I owe him an honest review of the story. First off, I must say that I read the book in two days. I am a slow reader and tend to analyze, critique, and rate books as I read them. It's a curse that I must live with. While reading this story, I stumbled very few times. I simply did not want to put the book down until I was finished! Roy McConnell did an outstanding job of weaving twist after heartbreaking twist into this thriller; all revolving around a fresh and unique story line. The story is 228 pages. The book is perfect bound, six by nine inches. I would have preferred standard trade paperback size binding. Nevertheless, the book was easy to carry and read. The book is printed by IUniverse and sold through all major online booksellers. I believe it is also available through Barnes & Noble stores, although I have not checked our local store. The printing is very professional with short chapters, broken into scenes with plenty of white space to help keep the reader focused. The reader is immediately drawn into the story through conflict and action. In the very first chapter, one gets a sense of just how cruel and selfish the antagonist is when he engages in a heated argument with the main character. The joining of the main characters into a common goal is seamless. Before long, enemies become friends but the antagonist (Wolf) always seems to be just one step ahead of them. I found myself cursing Wolf in every chapter as he plotted and schemed against his own daughter. I don't want to give away too much of the story, but suffice it to say, Roy McConnell is proving his writing prowess with this first novel with all the elements of suspense, and even a little science fiction; great tension, and even some very steamy love scenes. I found only four instances of missing or misspelled words throughout the entire book. This attests to the excellent editing performed on this story. I know this seems like a little thing, but I pay attention to little things like this. Maybe it's the writer in me, but I am critical of everything I read and can become totally disengaged when faced with numerous grammatical errors in a printed story. This book had so few errors that I had no problem staying with the story until the end. I would recommend this book to anyone who enjoys thrillers, suspense, or even romance. If you enjoy Dean Koontz, Lee Child, David Morrell, James Patterson, or even Dan Brown, you would do well to buy this book and give it a read. I, in no way, am endorsing or advertising any specific product. I'm merely providing my personal opinion of a work I've previously read.